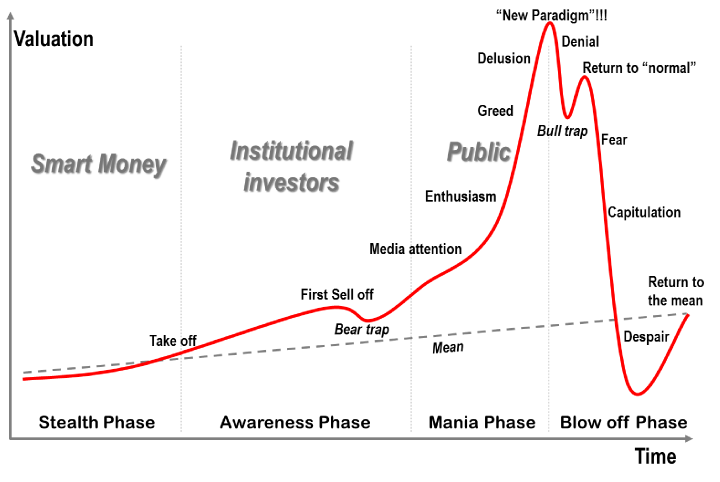 "Bitcoin is a bubble" has been the consensus view of the mainstream news since the beginning. And in my opinion it holds little weight. But just because the rationale doesn't hold up, that doesn't mean Bitcoin is definitely not a bubble. The sharp rally and sell off of the last few months do seem at least plausibly bubble-like. There is no way to know definitively whether or not Bitcoin is a bubble, but here are a few metrics we are looking at that may help inform your intuition as well. 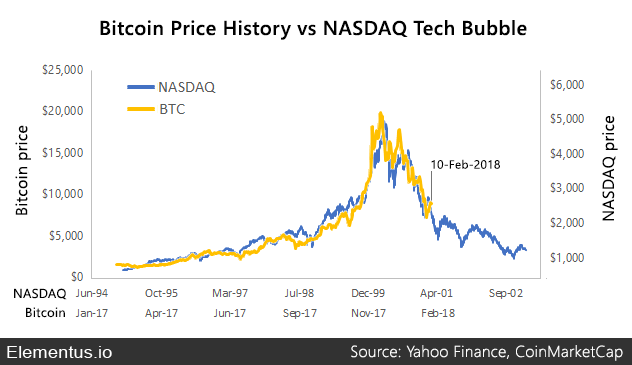 The other day, we tweeted out this graphic comparing the price history of bitcoin to NASDAQ during the rise and fall of the dotcom bubble. The time scale is not the same. NASDAQ took years to reach its peak, while Bitcoin rose 20x in less than a year. But the patterns look eerily similar. The charts both begin with a steady rate of ascent, followed by a kink where the slope shifts upward and the growth takes off. At the top, they both show the same double peak pattern, the first one taller than the second. And then they begin their fall back to Earth. By the time NASDAQ finally reached the end of its decline, nearly all of the gains it had accumulated during its dramatic rise had been lost. Does a similar fate await Bitcoin? This next chart is from Dr. Jean-Paul Rodrigue’s research on market booms and busts. He explains the pattern by breaking the lifespan of a bubble into four stages. Compare this chart with the ones above. It's nearly an exact match. The timespan and amplitude of market bubbles have varied over time and across different asset classes, but this same pattern has repeated over and over again. 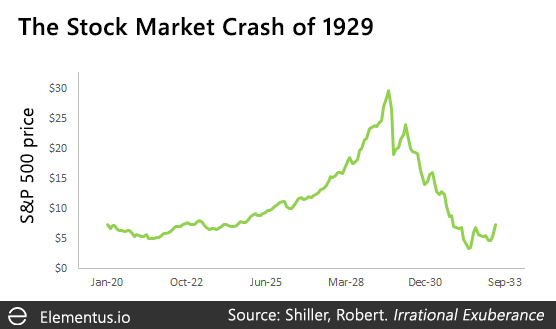 For example, here is the S&P 500 index before and after the crash of 1929. You can also see the same pattern in the gold bubble of 1980, Japan's stock market in the late '80s, the Shanghai Composite Index in 2007, and many other asset bubbles. If you squint, you can see the same "bull trap" double-peak pattern in U.S. home prices in 2006-2007. What's the difference between a bubble and a normal market fluctuation? 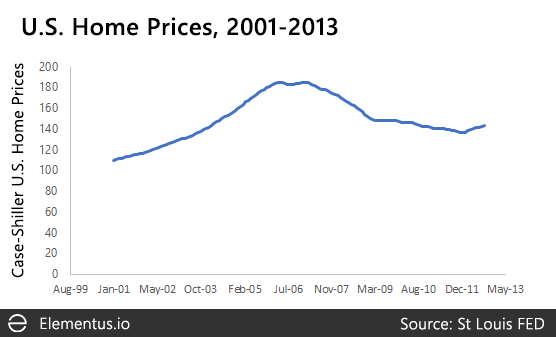 Most would agree that the U.S. housing market in 2007 was most certainly a bubble. But in terms of the price decline, it was not nearly as severe as the other bubbles shown previously. From its highest point to where it bottomed out, the U.S. housing market lost about 25% of its value. Compare that to the dotcom bubble, where NASDAQ lost 78% of its value, or the stock market crash of 1929, where by the late 1930's, the S&P 500 had fallen by 85%. 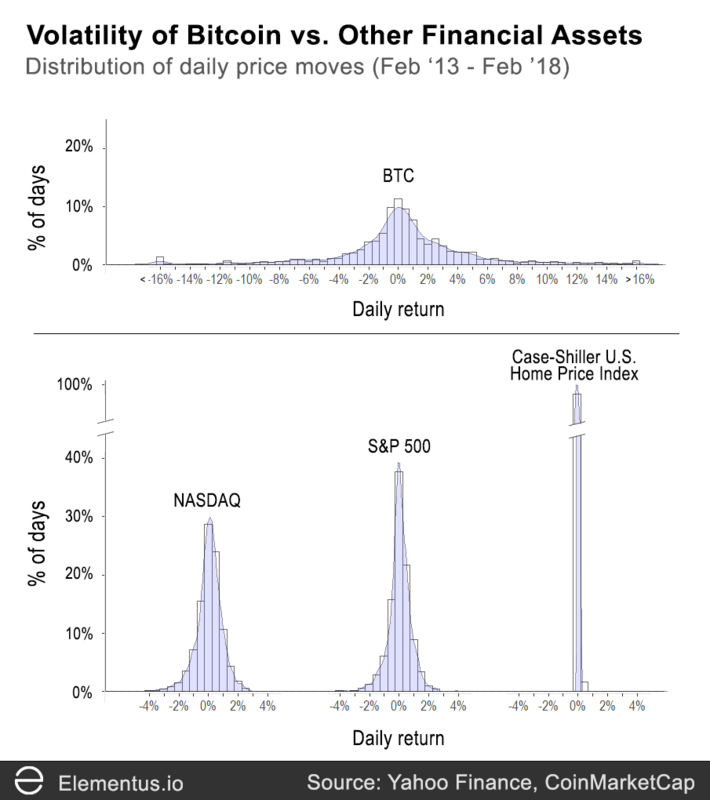 Even more extreme, compare the U.S. housing market to Bitcoin, which can move up or down 25% or more in a single day. And it does so regularly -- 8 times since 2013 to be precise. For Bitcoin, a 25% fall would not indicate a bursting bubble, but a normal price fluctuation that you would expect to see a few times a year. For U.S. home prices, which are historically very stable, a 25% fall is a once in a generation event. Bitcoin is and always has been a highly volatile asset. The chart below shows how its daily fluctuations over the last five years compare with NASDAQ, the S&P 500, and the U.S. housing market over the same period. The bars are histograms of daily price moves. The blue curves are smoothed estimates of the distributions (kernel density estimations). On average, Bitcoin's price fluctuates 5x as much as NASDAQ, 6x as much as the S&P 500, and over 100x as much as the U.S. housing market. So, is Bitcoin a bubble? Who knows? Bitcoin looks and feels a lot like other market bubbles from the past. And it has all the hallmarks of a bubble -- speculative buying, fear of missing out, a sudden frenzy of interest from the general public. The recent price decline is big, even by Bitcoin standards, but not out of the range of "normal" given its past fluctuations. Bitcoin is a highly volatile asset, far more than other financial markets we are accustomed to following. And we should be careful applying the same intuition to make predictions about its future price. Elementus is a semantic inference engine and data layer for crypto asset intelligence. Want to contribute or have an idea to discuss? We'd love to hear from you. Max is the Cofounder/CEO of Elementus. A data scientist by trade, he is an adjunct lecturer at UPenn with 10+ years experience trading derivatives at Deutsche Bank/Credit Suisse.